Here's a good news story to start our week with! Slotland has just had another jackpot winner -- Donna S., a regular at Slotland since 2012, hit the jackpot playing the Lucky Ducts slot game. She says she'll buy herself a present but a lot of her win will be donated to her local community center. Awwww, nice one Donna! Slotland's recent jackpot winner says she'll make a donation to her local community center. 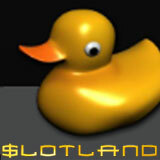 This isn’t the first time Slotland's jackpot, which is available on most of its premium games, has been won by someone playing Lucky Ducts. In March 2011, right after it was launched, Lucky Ducts paid out a $145,864 jackpot. A swimming pool theme game, Lucky Ducts is a 5 reel, 19 pay line slots game with up to 50x multipliers and lots of chances to win free spins. Water Faucet symbols fill the Bonus Reservoir and when it overflows 6 free spins begin. You can play most of Slotland’s 34 real money online slot games on your desktop, laptop, smartphones or tablets, but you can only play them at Slotland.